Found this forum while searching for a complete Character List for the Dune of Messiah book. Didn't found it here, but hey, this forum is pretty good. 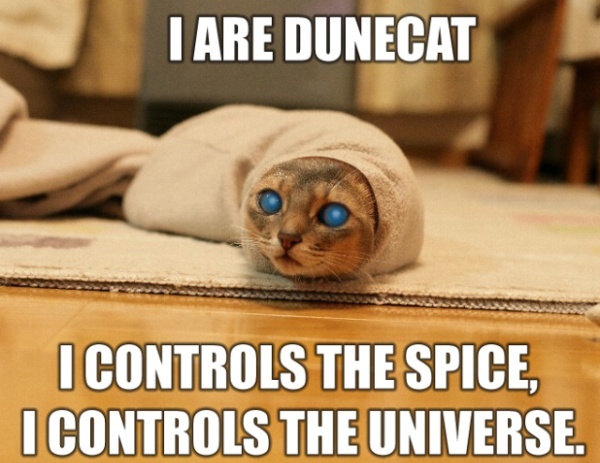 As for my knowledge of Dune, I've read till Emperor of Dune and didn't finished it, and seen the classic 80' movie and the two Sci-Fi Channel series. Um, pretty good? You're not going to find a better one... and it's in English, too! You are due for a full re-read of ALL the books (6). That (6) confirmes my assumption that this forum is mostly anti-Brian Hebert novels? Not that I care too much about BH, although I am somewhat curious about his novels, maybe cuz I really love the concept of prequel. Well, I'd already re-read DUNE last year, and a "Mafia" game based on Dune Messiah prompted me to pick exactly that book for re-reading. Mostly I was afraid of forgetting pieces of lore if I just restarted at Emperor of Dune, so re-reading is more prudent. Also... the reason I dropped ED is that I felt the book somewhat boring, compared to the their precedent three. ps. I'm not a native english speaker, I'm brazilian, to explain any strangeness in my writing style. publicano wrote: That (6) confirmes my assumption that this forum is mostly anti-Brian Hebert novels? That's an understatement, and it would likely be more accurate to call them KJA 'novels', Brian is just a Herbert name for the cover. BTW, it's GOD Emperor of Dune. Many people don't like it the first time but it ends up to be a favorite. How many is a brazilion? Just kidding, I actually heard a blonde girl say that once.